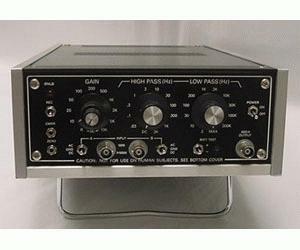 The Model 1201 Voltage Preamplifier with Remote Gain Programming Option (06) is usable in both computer controlled and manual applications requiring uncompromising performance. The 1201 features high impedance differential or single-ended input and superior common mode rejection performance with operation either in ac or dc coupled modes. This high performance preamplifier is an excellent choice for a wide variety of applications from evoked potential measurements to infrared radiometry.